Kratos' appearance in the Mortal Kombat reboot was as much Sony's idea as NetherRealm's, says the series' co-creator. God of War fans won't be in for any unexpected and unwelcome surprises when protagonist Kratos makes his debut in the new Mortal Kombat. That's according to NetherRealm's Ed Boon, who says that the studio had nothing but respect for the character. 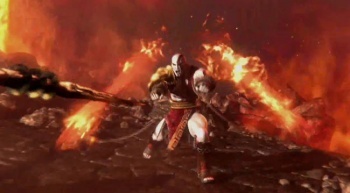 Boon said that there were always guidelines that a studio had to follow when it was working with a "great IP," and NetherRealm was collaborating with Sony's God of War team to ensure that everything about Kratos - from the way he looked, to the attacks he used - was as much like his previous portrayals as possible. Boon described Kratos as a "power character," whose attacks did a lot of damage, adding that Kratos was a very good fit for the Mortal Kombat universe. Boon also said that Kratos' inclusion wasn't a case of one side approaching the other, but rather the two companies thinking the same thing, at the same time. Boon said that both Sony and NetherRealm wanted to include a character unique to the PS3, and naturally, Kratos was everyone's top choice. Mortal Kombat comes out for PS3 and Xbox 360 in April.